Fossils of two mouse-sized, mammals from China, indicate that some of the earliest known mammaliaforms (extinct relatives of modern mammals), had already diversified and become highly adapted to different ecological niches. A joint Chinese/U.S. scientific team reporting in the academic journal “Science” discuss the implications for mammalian evolution and describe two new early mammals, one that was arboreal (tree dwelling) and fed on insects and tree sap, the other, a mole-like creature that probably spent much of its life underground. The tree dweller, named Agilodocodon scansorius lived around 165 million years ago, the subterranean creature called Docofossor brachydactylus was discovered preserved in slightly younger strata, it burrowed underground whilst dinosaurs roamed overhead some 160 million years ago. Both these creatures are Middle Jurassic Docodonts, an extinct Order of early proto-mammals. The discovery of these two very different fur covered animals further supports the theory that just like modern-day mammals, Jurassic forms were highly adaptable and early mammals diversified to take advantage of a large range of ecological habitats. The research team that studied these fossils, was made up of scientists from the Beijing Museum of Natural History and the University of Chicago. 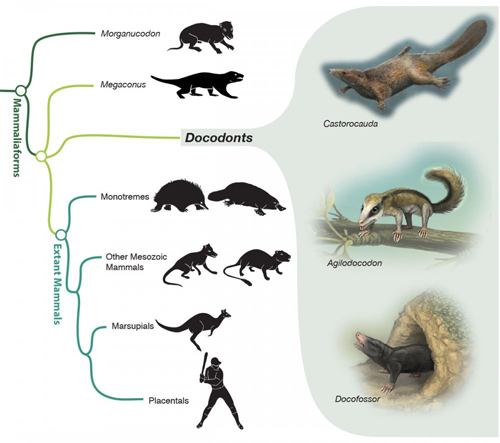 They conclude that Docodonts adapted to a very broad range of environments such as arboreal and subterranean habitats, despite competition from the Dinosauria, other reptiles and early birds. 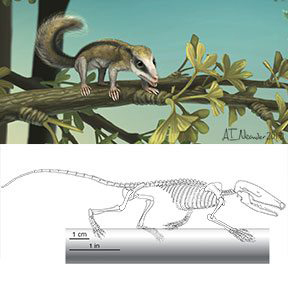 Agilodocodon was a small, swift animal with limb and finger bone dimensions that are comparable to modern tree dwelling mammals. Study co-author David Grossnickle, a graduate student at Chicago University emphasised that it was amazing to see arboreal adaptations occurring so early in the evolutionary history of mammals. He reflected that this research suggests that some extinct mammalian relatives exploited evolutionarily significant niches, long before true mammals. The Agilodocodon fossil material came from the Ningcheng County of Inner Mongolia, whilst the Docofossor material came from Hebei Province of China, to the south-east. Docofossor lived around 160 million years ago. It lived in burrows on shores of lakes and fed on worms and insects in the soil. This small creature had reduced bone segments in its fingers, leading to shortened but wide digits, perfect adaptations for digging. African Golden Moles possess almost the exact same adaptation. This characteristic is due to the fusing of bone joints during embryonic development. With African Golden Moles, the development of the digits is influenced by the genes GDF-5 and BMP. As the extinct Docofossor has a very similar anatomy, the research team conclude that this genetic mechanism may have played a comparable role in early mammal evolution. Mammals from the Middle Jurassic were once thought to have a very limited ecological footprint, only occupying a few niches in the food web. However, these two new fossil discoveries along with early finds studied by the Chinese team, fossils such as Castorocauda, a fish-eating, swimming Docodont described back in 2006, provide strong evidence that early mammals adapted to a very wide range of environments. Examining the phylogeny of early mammaliaforms. Although not closely related to modern placental mammals such as our own species, the Docodonts are revealing themselves to have been a highly successful and very adaptable group of warm-blooded creatures. It is the mammalian trait of being very adaptable that many scientists believe was key to them becoming the dominant megafauna after the demise of the Dinosauria, Pterosauria and marine reptiles. It seems this adaptability runs deep in the mammal family tree. Everything Dinosaur acknowledges the help of the University of Chicago in the compilation of this article.